Victorious armies have employed graffiti to celebrate their conquests for millennia. A photoessay at Poemas del río Wang utilizes images from the archives of LIFE magazine and other sources to document the extensive graffiti that characterized Berlin after the defeat of Hitler. The inscriptions remained intact for fifty years in the closed and isolated Reichstag. It was only in the 90s that they were discovered by Karin Felix, a collaborator of the restorations. She prepared a first, complete catalog of the inscriptions and she has made inquiries about the persons and the stories behind the names. 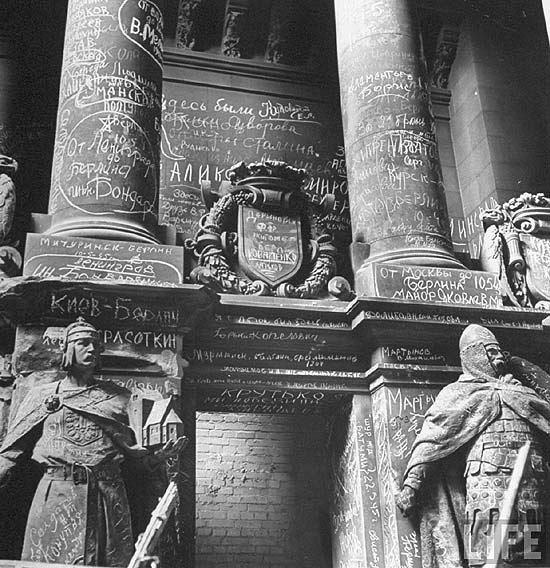 During the restoration of the Reichstag, some of the graffiti was conserved as an item of historical interest. True - I've been many times in the building of the Reichstag, as I live here in Berlin. Those graffitis were preserved in order to remember the fall of the city and those, who besieged it. Some of those graffitis can be seen on top, where the glass dome can be visited. Others can be seen on some walls of the corridors the visitors walk through.